Austrian cuisine consists of rich, satisfying dishes: roasted meats in cream sauces, hearty soups and stews, tasty dumplings, warm and cold salads, and of course, the pastries and cakes that remain Vienna's trademark. This cookbook provides a comprehensive guide to Austrian desserts, including six recipes for strudel, twenty recipes for gateaux, and many other sweet-tooth favorites. Elisabeth Mayer-Browne takes an engaging, conversational approach to her art, with common sense advice about preparing, serving, and even improvising. 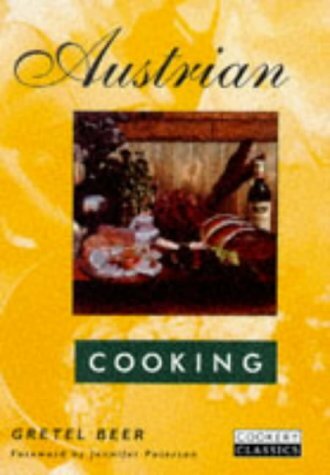 The Best of Austrian Cuisine, a classic title originally published in Austria, includes nearly 200 recipes for traditional family favorites and interesting variations, as well as menus for everyday meals and holidays. Now expanded to include a chapter on Austrian wines. 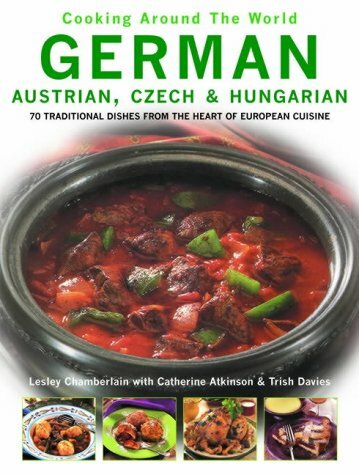 This is a very well written and practical cookbook for the very delicious and diverse Austriam cuisine.Austrian cuisine is such a mixture from all the lands of the old Habsburg Empire and almost all of the popular dishes served today are in here.It is especially written for English speaking people although thank God, the original Austrian food names are also included or I would have had trouble knowing what the exact dish the recipe was for.This book is recommended as a good introduction into one of Europe's finest culinary lands. Being of Hungarian descent, I found a few recipes that I could use especially the desserts.Brought back memories of my childhood. The "Best Austrian Cuisine" is not the best text for newcomers to Austrian cuisine to cook with. Ithas the briefest instructions on most recipes that I've seen in a good while. While this is fine for one accustomed to cooking Austrian cooking, it is not helpful to others new to the cuisine. Oneproblem is that it doesn't tell the reader when one cooking step is completed, as it's easy to greatly undercook or overcook with these brief instructions. For example, there are 6 sauerkraut recipes, however each starts with "put the sauerkraut in water" or anothersays "melt the butter and brown the sugar in it. Add the sauerkraut.." Yikes, nowhere does it tell how to make the sauerkraut.."Obviously" any (Austrian) cook should know that! For cheese soup, it says to "fry the flour lightly in the fat. "Most writers would give an endpoint, such as "till light yellow", or golden brown or till some distinct change, and perhaps tell what may happen when it's been fried too long...not ging to find such assistance in this book. For making dumplings, "roast white bread or rolls in about one ounce of fat. Mix the eggs with the milk and and pour over dumplingsand leave for half an hour"Roast how long? Roast until what desired change happens?How exactly does one "roast" in this cuisine, anyhow? 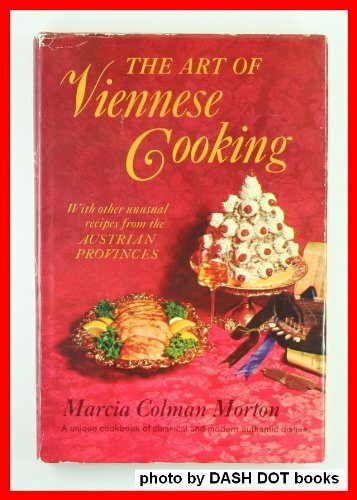 This is a "reminder" type of a cookbook aimed at experienced Austrian cooks, and of little use to a newcomer to Austrian cuisine. A shame. It also lacks photographs, so best of luck trying to make an authentic presentation, if you are a newcomer to the cuisine. 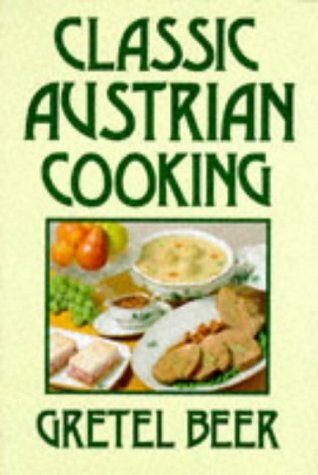 Thus, it is clear, as the jacket says, thatthis was "originally published in Austria", for Austrians, and is ill suited to those not well acquainted with the techniques of proper Austrian cooking. Some photos would have been nice, but then I'm sure the book would have cost much much more, and the price is one nice thing about it. I also didn't have any of the problems of the first reviewer- it was all clear in my edition. I found some Austrian wines to go with the dishes at www.winemonger.com and had a great party! Hmmm... My copy of this book doesn't have the problems mentioned below, but then it's a 2001 reprinting and is perhaps corrected. 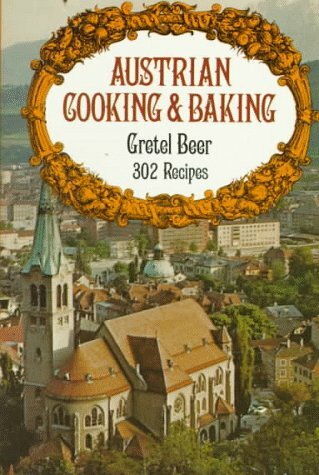 In the late 1990s I rented a room in Vienna from an 80-year woman who cooked for me every Saturday.Since then, I've longed to replicate the delicious, savory, and often quite filling meals that we ate together.I've read dozens of Austrian cookbooks, and this is the best by far.Most others are either hopelessly out of date, written for non-American audiences (like Gretel Beer's famous but useless volume), or concentrate on what I'd call "restaurant food"--special, elaborate, time-consuming dishes that don't exemplify what a typical home-cooked Austrian meal is like.This book takes Austrian "Hausmannskost"--everyday food, the sort of thing you'd eat for Tuesday dinner--and translates it to the American kitchen.The recipes are perhaps a little vague here and there and assume previous experience in the kitchen, but the author's point usually is clear.And is it ever authentic; the kohlrabi recipe on pg. 79 is *exactly* my landlady's, and it's delicious. I bought this book as a gift for friends of mine who love Austrian cuisine. I am from Austria and was disappointed with this book. Aside from many spelling errors in the German titels of the foods, there is a picture of Innsbruck (ever heard of the Golden Roof that it is famous for?) and it says ... Austrians and tourists alike enjoy... Salzburg! Could have maybe overlooked that fact but the Sachertorte in this cookbook looks nothing like a Sachertorte I have ever seen anywhere in Austria. Save your money and have somebody bring you a cookbook from Austria that has been translated into English. Not just a cookbook for kids! 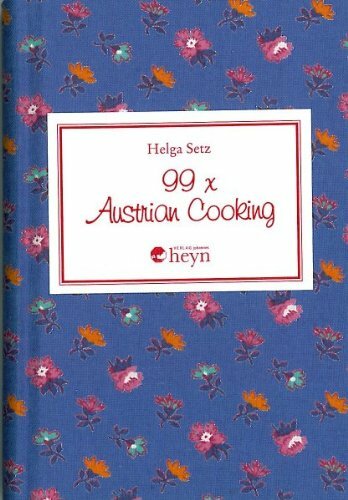 This is a wonderful book for anyone, of any age, to learn some traditional Austrian recipes.It gives you the "basics" that you need to know.In other words....Classic, easy, (and quite tasty) recipes that can be easily made in the American kitchen. 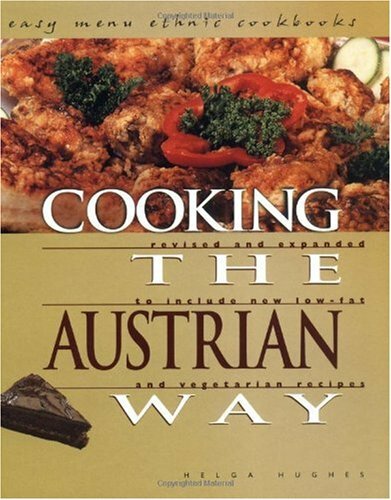 "Cooking The AustrianWay" is not packed with hundreds of recipes. 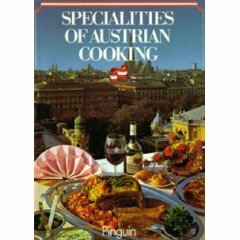 However, it does containa few classic recipes.It is a great start to Austrian cooking. authentic recipes offer the best in Austrian home cooking: beef broth with dumplings, potato soup, kalbsgulash, four kinds of schnitzel and more, including 171 dessert recipes—apricot dumplings, Linzertorte, Sachertorte, apple strudel and much more. Great recipes, but you need a scale to measure products. I also didn't like the fact that no oven temperatures were given unless you have an oven from England. If this book is to be sold in the US market, the editors could have at least adapted the information to our standards. I'm no amateur in the kitchen, but someone who is will have a tough time calculating oven temps. The layout of the recipes could've been better by listing the ingredients and then instructions. Instead it was done in a paragraph form which can make it confusing. All in all I'll keep the book, but am a bit disappointed with how it was put together. This small book is chock full of Austrian recipes.As I was told, my grandmother from Austria regularly cooked these meals from scratch.Unfortunately, the recipes were not put down on paper to pass on through the generations.If you think boiled meat sounds frightening, think again.Purchase this book and prepare Tafelspitz and your taste buds will never stop thanking you for it! You can gain weight just reading this book, but your mouth will be happy! A passionate home cook that has been honing her cooking skills for the last 25 years, concentrating on Italian cooking for the last 10 years, writes this review.My favorite cookbooks are "The Professional Chef" by the Culinary Institute and "Culinary Artistry".With more than 500 cookbooks in my collection I am usually disappointed in my recent cookbook acquisitions.This particular book is on loan from an Austrian friend, whose two brothers are chefs in Austria.Given that a woman born and raised in Austria thinks the recipes in this book are authentic I have to assume that she knows more than the reviewer that disagrees. Before I review the book, I must say that if you are on a diet, this is not the book for you.I think that you could gain weight just reading this book.However, if you are a fan of desserts, WOW what a book! The first chapter the author explains the difference in some of the typical ingredients of Austria.She also provides a table that translates the European Gas Marks into degrees, which I do not see very often in foreign cookbooks. The garnishes for the soup alone are worth the cost of the book.I have never seen such variation in noodles and dumplings.And then, there are the schnitzel recipes.Can you say yummy?Where do you even begin talking about how wonder a well-made schnitzel can be?Makes me long for Berghoff's Restaurant in Chicago, an institution that is now gone. The Austrians apparently have their own version of Risi Bisi, which I was certain was Venetian.But maybe I am incorrect.The difference between the two versions seems to be that the Austrian's do not use Arborio rice. The Dessert sections are absolutely amazing.The Austrians have taken dessert making to a new level.Each recipe is more mouthwatering than the next.There is a recipe for Strudel dough, and every Austrian dessert that I could think of.If you love desserts, these chapters make the book worth buying alone. 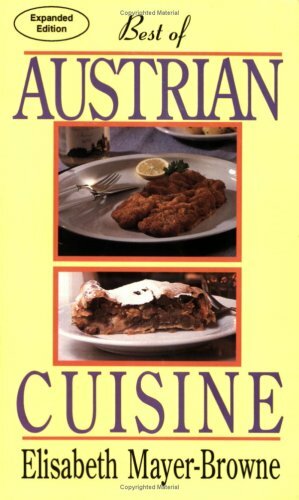 Overall, I would highly recommend this book to anyone that loves Austrian food, or just good food.I borrowed this copy from an Austrian friend, but I will be ordering my own copy. All in all that book is worth the money, most recipes are quite original, and the instructions are good. Photos would be helpful. For this price I would buy it again. Having some Austrian ancestry in me and having sampled some fine Austria fare, ventured to try and find a good source.This isn't completely what I am looking for. Recipes are too basic, not enough purchasing and prep hints.No photos whatsoever to entice. Did find some interesting stuff, though: Wuerstelbraten, Galantine of Chicken, Souffle Rothschild. This is update of a 1954 cookbook, with ingredients brought up to date with supply and some techniques also caught up with modern equipment.The cake war, as author calls it, is also updated. I agree with another reviewer who thought photos would have enhanced this, as they do all cookbooks.It certainly inspires one trying it after seeing it prepared and presented. I am very pleased with the purchase of my Time - Life book. The condition and complete package as listed is perfect. This cookbook is a keeper! From the famous Time-Life series, includes dishes from soup to dessert. Some of the recipes are: Cold sour cherry soup, liver dumplings, fish Dalmation style, Anchovy butter sauce, Hunter's stew, Transylvanian goulash (Okay, where's my copy of Dracula? ), Lemon and sour cream salad dressing, and of course desserts like Emperor's pancake, Chocolate cream slices, and Spanish Wind cake.